I am beyond excited to share some of my favorite recipes, and today I am going to be sharing this mouthwatering Instant Pot monkey bread recipe. It’s so easy and so delicious that it disappears in a FLASH! But before we get started, are you following me on Pinterest yet? You should! Lazy Saturday mornings are my favorites, followed closely by long afternoon naps. There is no mad dash to get out of the door for work or school and we can lounge around and munch on our favorite snacks. It’s also the perfect time for me to break out and make my favorite Instant Pot recipes. Have you jumped on the Instant pot bandwagon yet? I jumped in both feet first and have been nothing but happy with it. If you are looking for a kitchen gadget to make life a little easier, you are going to love the Instant pot. Check out all of my favorite Instant Pot recipes here. Why do I love using my Instant Pot so much? Not only is it easy to use, but you can convert so many recipes that would normally take hours into about one fourth of the time. Not only is it a time saver, but you don’t have to sacrifice any of the flavor from cooking all day. It’s amazing, and if you don’t have one, I would highly recommend looking into it! 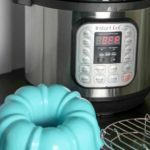 What do you need to make the Instant Pot monkey bread recipe? To get started, add the 1 1/2 cup of water to the Instant pot and add the trivet that came with your pressure cooker. Add the white sugar, cinnamon, and biscuit dough to the ziplock bag. Then shake well until everything is coated. Set the lid and turn until locked. Set the manual mode for 20 minutes and allow your bread to cook. Over medium heat melt the butter, vanilla, and brown sugar. Place the monkey bread on a plate, and then drizzle the top with the butter and brown sugar. This is such a yummy and easy recipe. If you have been searching for an easy dessert to make in the Instant pot, You’ve found one with this Instant Pot Monkey bread recipe. You won’t be disappointed! If you are looking for more recipes to make in your Instant pot, check out my Instant Pot Roast recipe and my Instant Pot Hawaiian Chicken recipe. Both are easy and delicious dinners! This easy Instant pot Monkey Bread Recipe will have your whole family excited! Perfect for a breakfast or a dessert. To get started, add the 1 1/2 cup of water to the Instant Pot and add the trivet. In a large ziplock bag, add the white sugar, cinnamon, and biscuit dough. Shake well until everything is coated evenly. 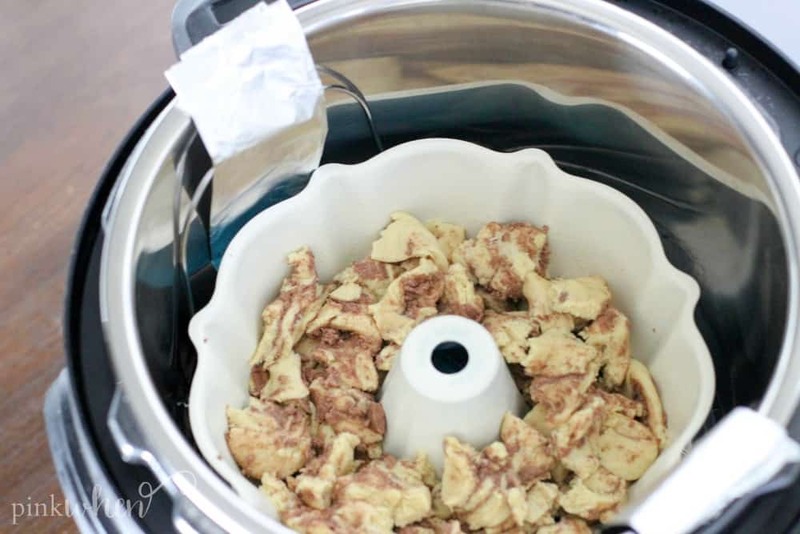 Place a long strip of foil that is rolled into the bottom of the Instant Pot. Make sure the sides of the foil come up to the top of the pot. Place the dough mixture into a small bundt pan. Place the bundt pan over the foil on the trivet (using the foil as a sling). The foil is going to be used as makeshift handles to easily remove the bundt pan from the Instant Pot. Place the lid and lock it securely in place. Set the manual mode for 20 minutes and allow the bread to cook. Over medium heat melt the butter, vanilla, and brown sugar. Place the monkey bread on a plate and drizzle with the butter and brown sugar sauce. This is superb! It is so quick and easy. I have the mini instant pot, will this work in this? I love my instant pot so far!!! Hi Millie! 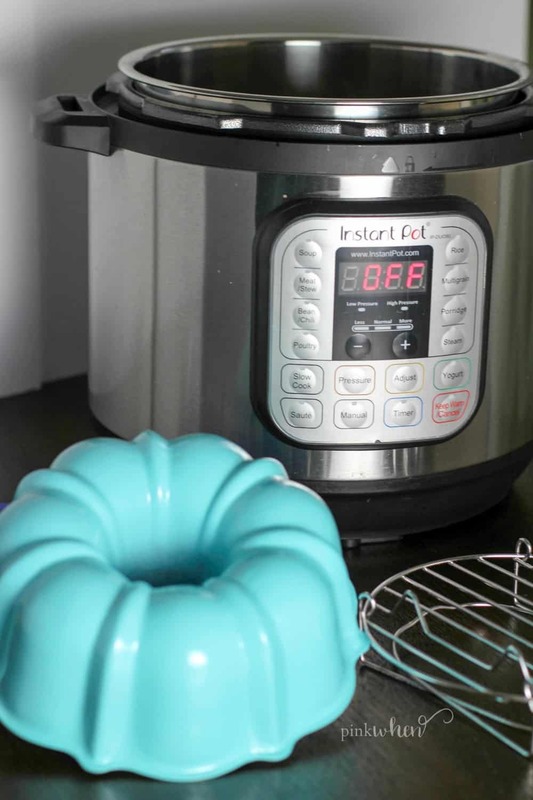 I would check the diameter of the small Instant Pot (I don’t have a small one so I am not familiar with it) and the diameter of the bundt cake pan and make sure it fits. 🙂 You can generally check those sizes when ordering online.